Cataract is the leading cause of world blindness, even though it can be surgically removed. To raise awareness on preventing visual impairment and restoring sight, World Sight Day is observed on 11th of October this year. This map shows the health burden imposed by cataract by region and cataract surgical rate by country. As depicted by graduated colours, less than 1000 cataract operations per million population within a calendar year was observed in most sub-Saharan African and Southeast Asian countries. 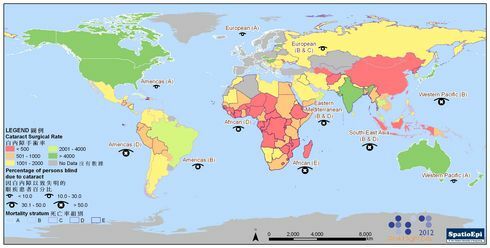 In these regions, the percentage of blindness due to cataract, indicated by blue eye symbols, was also among the highest in the world. On the contrary, low proportion of blindness was caused by cataract in developed world, where mortality is low or cataract surgical rate is high. Both mortality and cataract surgical rate could reflect the delivery of healthcare services, which in turn influences the proportion of blindness due to cataract. Data for the map were obtained from a report published by World Health Organization in 2007. In normal eye, the lens is clear and transparent so that light from any object can pass through it and form image on the back of the eye. The condition of blurring of images due to a cloudy lens is called cataract. Cataract is usually asymptomatic at the early stage. As cataract progresses, patient may experience progressive blurring and dimming, glare in bright, fading of colour, frequent change in glasses prescription and double vision in the affected eye. Most cataract cases are related to advanced age. In other cases, cataract may develop after prolonged exposure to ultraviolet light from sunlight, eye injuries, inflammation, diabetes mellitus or some other eye diseases. There are no effective medications or nutritional supplements for preventing the formation of cataract. Reduced sunlight exposure by wearing sunglasses and proper management of eye and systemic disease may delay or prevent the development of cataract. Cataract extraction surgery is the most effective treatment. By replacing the opaque lens with an artificial intraocular lens, most cataract patient can restore sight after the operation.